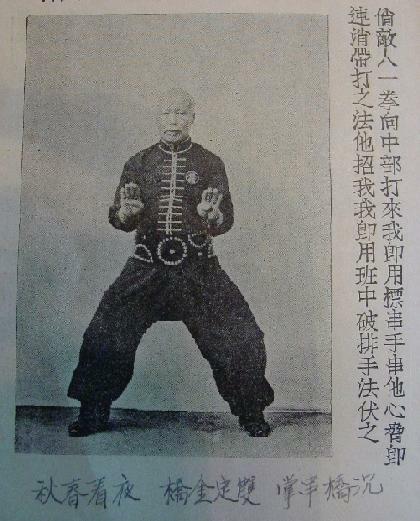 he “iron forearm” is a training routine I learned early on in Kung Fu. Sweat ran freely after only a few minutes of this 3 step pattern. And so did the pain! “Lower in horse!” the teacher yelled as I pounded my forearm against my partner’s. He always made sure to enforce that part of the training: the harder your arm connected with that of your partner the lower you had to sink in the horse stance. Hot summer nights were the worst. We wore traditional uniforms of connaught satin with a long row of buttons down the front. He allowed us to roll up the sleeves to the elbows. You could see the sweat fly off the skin as the forearms met. 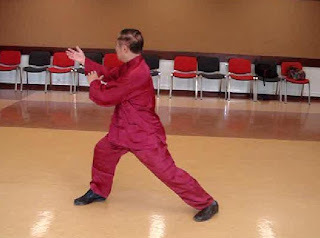 Nowadays, I don’t recommend that type of intensity – unless you have the right teacher as I did who can lead you through the process without injury (superficial bruises, deep and prolonged bruising, permanent weakness in the arms, nerve damage, hairline fractures). And then only if you have access to really good dit da jow liniment. Why did we do it? First, to learn to “eat bitter”…to build resolve and to learn to never give up whatever you have to suffer through. We also wanted to “harden” the forearms to a point where a block or a strike on an attacker would have devastating results. You can achieve the same results using less striking intensity. It might take longer to achieve but the method of using relaxed power is just as effective. 1. Stand in a horse stance (feet spread, both knees bent directly over both feet, back straight). Just like sitting on a horse. Your partner stands in the same stance in front of you. 2. Swing your right forearm (palm faces the ground) from the area of your right hip out across in front of you. 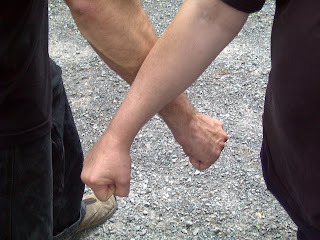 Your partner does the same with her right forearm. The middle of your forearms touch in front of you. 3. 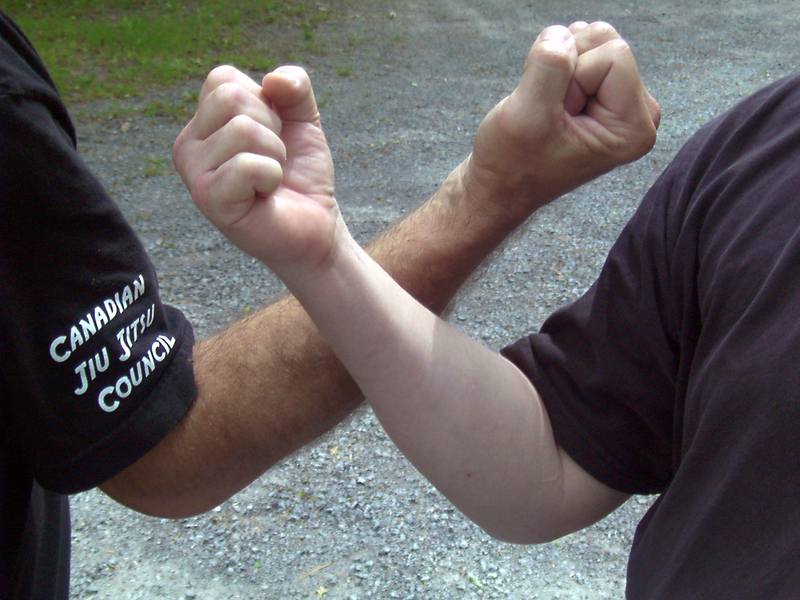 Now swing both of your right forearms back up and across toward the right (like an inside block in Karate). The forearms meet on the radial side . 4. 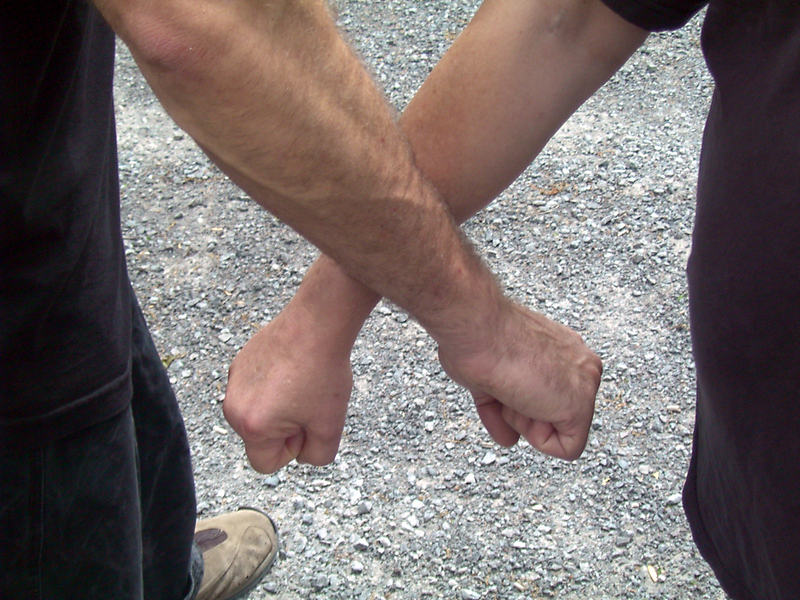 Now swing both of your forearms to the left and down to the right in front of you (like a low block in Karate). Your forearms meet on the ulna side. 5. Switch to the left arm, going through the same 3 step pattern. Then switch to the right again. Go back and forth, right arm…left arm. 6. Slightly more advanced – as your right arms clash with the first strike, swing from a horse stance to a left bow and arrow stance (forward stance). Complete the first 3 steps of the right arm. Now switch your weight over to the right into a right bow and arrow stance and strike with your left forearms. Always strike very lightly. You’ll develop power through the flow of energy up and down your arms. As you learn to relax, speed will increase. Try the same training blindfolded or with your eyes closed. That too will improve your speed. 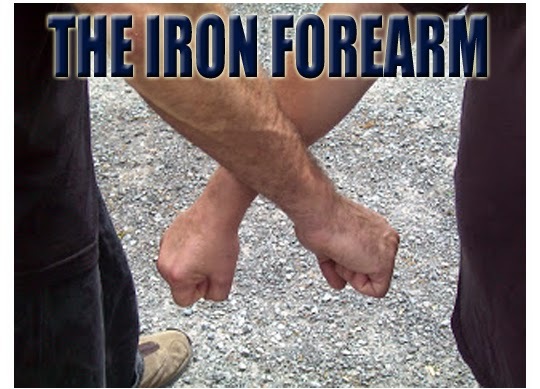 The “iron forearm” is a type of training shared by many across the world. You might be practising the routine on a Wednesday evening in your class …while people are practising the same thing in Singapore, Brazil or France. That sense of community is always a bonus!